Bellatrix, I'm a Pug! : Reunited and it feels soooo good! So as you know mom and dad left for their vacation for one whole week and I went off to grandma's. Now I love me some grandma's, but I missed my most specialist friend in the whole Pugverse...my Spencer. So when mom and dad told me that Saturday I would once again be reunited with my beloved, I was ecstatic! Mom had to work (bummer), but dad was still on vacation...so he was cool enough to take me to my Hambone. I was a little nervous...would he remember me? It had been like a whole week. Would he want to play? Would he let me bite his leash? oh I was soooooo nervous! Well once our chauffeurs (aka his mom and my dad) pulled up, the sparks flew. Oh it was so good to once again be in the same park as Spencer Bartholomew. We ran around for hours, dug holes and wrestled around. It was ecstasy. We haven't stopped playing since! I know you all have BFF's out there...what's the longest you've been separated? Were you able to cope? I know it's gonna be a long time before I give mom and dad permission to go on a vacation again! Awww, Bella-T you guys are tight! Of course Spencer B remembered you. I don't know if I have a BFF? I guess it could be Frank, but we don't see each other all that much. So maybe my BFF is Dutch? We're together pretty much 24/7, 365. Don't tell anyone, but I don't like going places without him. He makes me feel... safe. Puglet I know how you feel, Dutch makes me feel safe too! He's so big and strong, I can see why you like having you around. Bummer you don't get to see Frank much, he's a totally fun guy! Hi Bellatrix! I told my parents that they couldn't ever go on vacation after they came back from the last one but they are leaving me again this weekend. Ugh! What am I going to do? I'm going to stay with the poodles who I love but I don't think we're BFF's. I guess I'm not sure who my BFF is but I used to have one named Rudy but then he went to sleep. I think Puglet is my BFF but I've never even met him. Hey Bellatrix!! It's the Izzy!! Yous gots me today! Anakin is still resting and Josie just read something and is off crying in the corners?? Anyways... You calls Spencer your Hambone!! That's cutes!! I'm on agains off again with TheBean, my shitzu boyfriends. He lives in SC. 'dats not the issue. The issue is 'dats he's just as crazy as me's. His Mommy and My Mommy are best friends and both have the honor of having such well behaved doggies! (ha ha) Mommy's friend is always telling Mommy the trouble Bean gets into and I am like O.K. he's a little much to handle sometimes...even for me!! Glad you enjoyed your day with your Spencer Man and I'm sure he was just as happy to see his Bella!! I guess Zoey is my BFF, but she's my mom, does that count or does your BFF have to be someone you don't live with? We don't always get along but I'm lost when were separated. We're glad that your Pugverse is back in order. 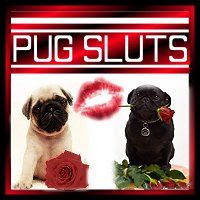 My Mom found your blog while reading Puglet's blog. She fell in love with your stories and fun adventures. Glad your Pugverse is back in order and you got to see your BFF. 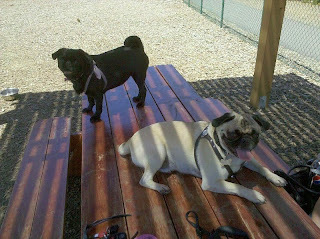 I guess my BFF would be my sister we are like Puglet and Dutch, except I take care of her. Thanks for being you and a new friend. Hiya Stubby, sorry to hear your bestie went to sleeps, but you can totally be besties with Puglet. Even if you never meet, it's how he makes you feel that really matters. I know someday another BFF will come along for you. Elgin gang...are you BFF's with each other? If I lived with Spencer I would be in pugtopia! Hiya Pheobe...Zoey can totally be your bestie. Sometimes you can have too much of a good thing and you need a break. It just makes you appreciate each other even more. Love the name! Spencer dressed up like Rampug at a pug event, but his outfit was a little too small and his mommy had to take it back : ( Welcome to reading my blog! I'm so excited you take the time to read my silly adventures. That is so cool that you have a sister to hang out with! I just have my 'rents and let's just say they're no Spencer! 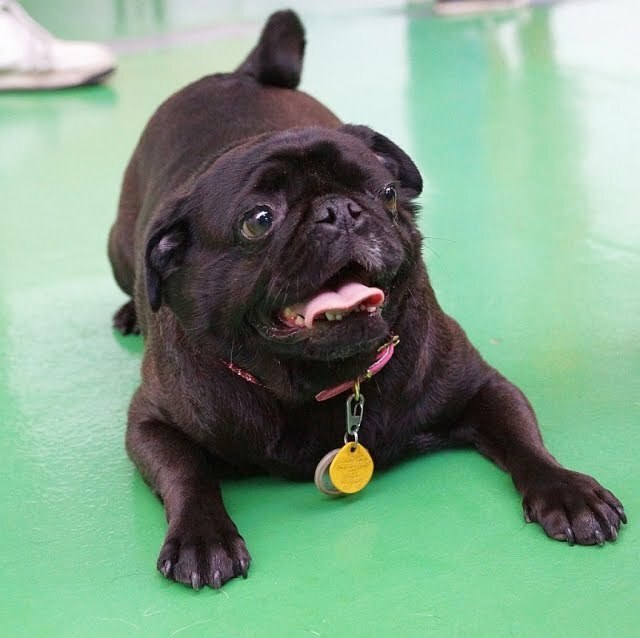 I hope you keep sharing yourself with me, and if you live in the East Bay (that's near San Francisco) you should totally come join me and Spencer for Pug Saturday! !